In the bottling and brewing industry the process water and carbonating gases may require additional purifying treatment. Even when the incoming process water is from a municipal drinking water source, the water may contain trace organics and residual tastes, odors, disinfection by-products, and free- and combined-chlorine that requires final treatment/removal. 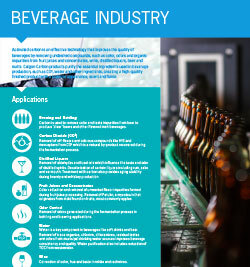 Depending on the quality of the incoming water, there are a variety of activated carbon products and solutions that improve water quality for the brewing/bottling industry. Activated Carbon and Ion Exchange systems can also used to remove color from malts for use in clear beers and other flavored malt beverages. Products that require carbonation typically utilize activated carbon treatment of gases to remove unwanted taste and odors. Activated carbons are an effective treatment to help ensure that water and gases are contaminant-, taste- and odor-free. ISEP® and CSEP® systems are used in the deashing and decolorization of brewery liquor. Additionally, the ISEP and CSEP systems are used in many separating, recovery, purifying and synthesizing applications.